High performance canopy flight is making a resurgence in popularity amongst the skydiving community as manufacturers continue to develop more advanced technologies. As is the case with most disciplines in our sport, there is importance in properly outfitting yourself to be successful in this technical field. When considering the optimal gear for canopy piloting, it is natural to consider the obvious topics of canopy model, size, and wing loading. However, there are more factors that are often overlooked, like harness sensitivity and comfort, line type, riser type and use of an RDS. As we know, not all rigs are the same, and same goes with the harness construction. 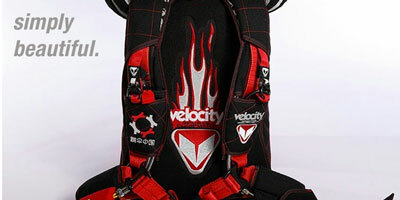 Through years of design and construction, Velocity Sports has created a product that emphasizes safety, control, and comfort. By optimizing dimensional stability through the webbing, energy can be more evenly distributed to risers. This control results in better efficiency through harness input and more accuracy without compromising power. Along with the use of an Infinity belly-band, the hip ring placement and leg strap construction create a hinge, allowing for a more seamless transition forward in the harness - allowing the wing to fly further. Hip rings on floating laterals (variable geometry harness) move forward allowing your body to sit more in the harness. Part of the increase in performance comes from a decrease in drag due to a more streamlined body profile. Velocity offers low drag competition risers, with reinforced front dive loops, that will allow for longer and faster swoops. Furthermore, we added an additional guide ring for the steering line at the top of the riser next to the links. This gives you an additional 4-6" to pull down the front risers without risk of deforming the tail of the wing, and less deformation means faster, longer, better swoops. Additionally, that guide ring provides an added safety measure for swoopers, as it allows you to more easily hold onto your toggles when pulling the dive loops, therefore decreasing the risk of dropping a toggle at a critical moment. Now, of course more power is a good thing, but so is comfort. Overall, the Infinity is well known for its comfortable fit. Infinity offers double wide leg straps to provide a larger, more comfortable seat while you are under canopy. We want you to crank some fast turns and feel those G-forces in your stomach, not in your legs. So as those turns get bigger, and your swoops get faster and longer, start considering how your gear best sets you up for success in this discipline. World class canopy pilots, such as TJ Landgren, Jeff Provenzano, Katie Hansen, David "Junior" Ludvik, and others fly Infinity rigs, so don't hesitate to flag them down when you see them at the dropzone and ask how their Infinitys help them to do what they do. If all companies worked like Velocity does, the whole world would be a better place.